“We are proud to announce our 63rd consecutive profitable quarter,” stated Maurice J. Gallagher, Jr., chairman and CEO of Allegiant Travel Company. “Our transition to an all-Airbus fleet is nearly complete. Our decision to move the transition up by a year from 2019 to 2018 has proven to be an excellent one given the higher fuel cost environment. Compared to our all-MD-80 fleet from 2010, we expect our ASMs per gallon to increase by almost 40 percent in 2019, from 59 ASMs per gallon to the low 80s. We will have purchased and inducted 43 Airbus aircraft, while retiring 47 MDs. We will have trained more than 350 Airbus pilots and 300 maintenance technicians as well as our flight attendants, ground staff and other operations personnel by the time we fly the final MD-80 flight at the end of November. We have grown the Company 20 percent in capacity (ASMs), adding 51 routes and carrying 13.6 million passengers during the last twelve months, an increase of 1.64 million passengers over 2016. We have dramatically improved our operations. Since last October, we have led the industry in monthly completion factor six times and have been among the top three except for a few months. Our on-time performance is improving nicely as well; this September we were up ten percentage points in A14, from 72 percent to 82 percent. “I couldn’t be more excited about where we are at this point in our history. As we outlined in our Sunseeker Resort investor day, we are ready for Allegiant 2.0. Stay tuned! Aircraft listed in table above include only in-service aircraft, planned retirements and future aircraft under contract (subject to change). Top Copyright Photo: Allegiant Air McDonnell Douglas DC-9-83 (MD-83) N411NV (msn 53245) RDU (Ton Jochems). Image: 944220. 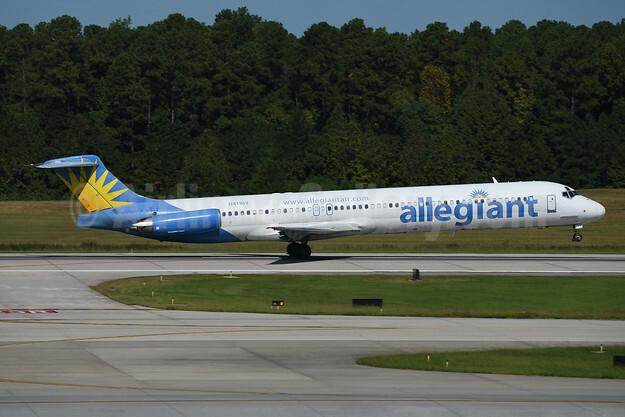 This entry was posted in Allegiant Air, Allegiant Travel Company and tagged Allegiant Air, McDonnell Douglas DC-9-83 (MD-83), msn 53245, N411NV on November 1, 2018 by Bruce Drum.